Florence Thompson with one of her children, Watsonville, California. Thompson was only 32 in this picture by Dorothea Lange, an outtake from the photo session which generated the iconic “Migrant Mother” image. Born in 1903 in what was then Indian Territory, now part of Oklahoma, her parents were displaced Native American Cherokees. Marrying at 17, she and her husband began a family in California. When her husband died, Florence was left with six children at the age of 28. She went on to have four more children, three with a Californian man, Jim Hill. At the moment Dorothea Lange encountered the family, their car had broken down while journeying to find crop-picking work. Hill and the boys in the family had walked into town to get parts for the car. Stanley Kubrick is a hugely significant figure in the history of cinema, directing 13 major feature films including Spartacus, A Clockwork Orange, The Shining, Full Metal Jacket and the ground-breaking 2001: A Space Odyssey. But prior to his film career, the young Kubrick was an apprentice photographer at Look magazine. First using a camera for his school’s publication, he was offered an apprenticeship at Look after he submitted a photograph. This picture of people arriving at the Chicago Theatre, North State Street, Chicago, is drawn from a set of pictures the 21-year-old Kubrick took for the Look series “Chicago - City of Extremes”. The theatre production in question, starring Jack Carson, Marion Hutton, and Robert Alda, was John Loves Mary, a farce. Confederate prisoners at Seminary Ridge during the battle of Gettysburg. Until 1863, both sides in the American Civil War of 1861-1865 used a parole system for prisoners. A captured soldier vowed not to fight until he had been exchanged for a soldier fighting for the opposition. But in 1863, when this picture was taken, the parole system proved untenable, because Confederate authorities would not recognize a black prisoner as equal to a white prisoner. The direct result was that the number of troops being held in prisons increased massively, on both sides. Just over 400,000 soldiers were taken captured and placed in prison camps during the American Civil War. One in ten of all deaths during the war occurred in a prison camp - a total of more than 55,000 men lost their lives incarcerated. This Union soldier is believed to be Sergeant Samuel Smith, together with his wife Molle, and daughters Mary and Maggie. Smith served as a soldier in the 119th US Colored Infantry, enlisting at Camp Nelson, Kentucky. Formed during the American Civil War, after Lincoln’s Emancipation Proclamation came into effect on January 1st 1863, the 175 regiments of the United States Colored Troops (USCT) were largely but not exclusively formed of African-American soldiers. In total, around 180,000 free African Americans together with Native Americans, Asian Americans and Pacific Island Americans were enrolled in the USCT - around one tenth of the Union force. Almost 2,700 were killed in combat - but that is a figure dwarfed by a total of 68,000 killed chiefly by disease - the largest cause of death in the War. The regiments were led by white officers. Soldiers of the 164th Depot Brigade form a service flag at Fort Riley in Kansas. Arthur Mole achieved some renown as a photographer of patriotic American images such as this - though by birth, Mole was actually British. Still, he directed his photographic attention to US military bases and installations during the First World War, seeking to build up a sense of patriotic fervor and enthusiasm. After composing and planning for a week, Mole and his associate brought an 80-feet high platform to each military establishment, from whence, through a megaphone, Mole proceeded to direct vast numbers of serving troops and other staff into his enormous ‘living insignia.” It would take several hours or moving and standing before the picture was laid out to Mole’s satisfaction. Oklahoma’s Fort Sill - the burial place of the Native American, Geronimo - housed static kite balloons, inflated with hydrogen such as this one. The balloons were deployed for the observation of artillery attacks, and were secured with guiding cables by groups of ground staff. Six troops were killed in the accident captured here on camera, at Henry Post Field at the Fort. The hydrogen in a balloon was ignited by a what is believed to have been a static electricity charge, created as the folds of the balloon fabric were rubbed together. Thirty more troops were injured. 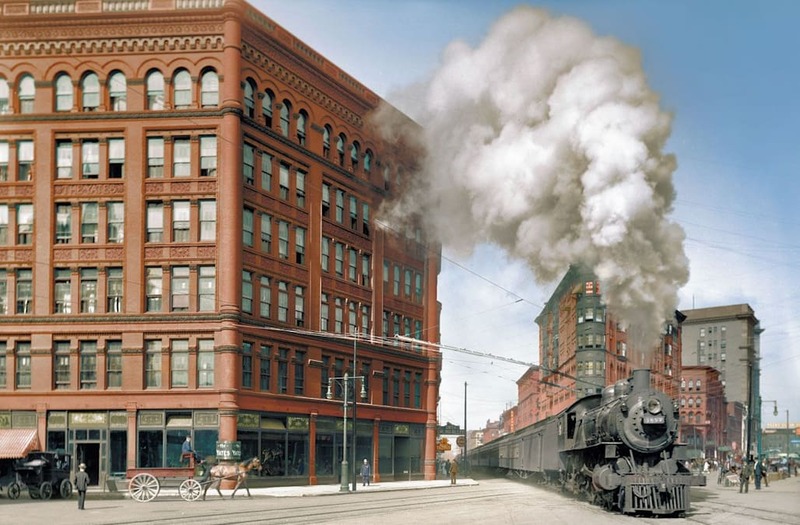 The "Empire State Express" (New York Central Railroad) passes through Washington Street, Syracuse, New York. The Empire State Express was the flagship train of the New York Central and Hudson River Railroad. It also had world renown as the first passenger train with a speed scheduled above 50 mph, as well as undertaking the longest scheduled nonstop run, between New York City and Albany, for 143 miles. Trains have run on the roads of Syracuse, New York since 1859, earning the city the sobriquet "the city with the trains in the streets." As well as the obvious safety concerns, the situation also brought noise, dirt and pollution to Syracuse citizens. At peak points, around sixty trains ran along Washington Street - though that era finally came to an end in 1936 with the arrival of an elevated railroad and a new station on Erie Boulevard East. The final train to run on Syracuse streets was the Empire State Express - eastbound. Celebrations on Wall Street, New York following the surrender of Germany. This picture is almost what it seems - but not quite. We know the exact moment this picture was taken, 1:52 PM on Thursday November 7th, 1918 - four days before the end of World War One. The premature report of the end of the Great War originated in a casual lunchtime conversation between Admiral Henry Wilson, commander of the American Naval forces in French waters, and Roy Howard, President of United Press. Wilson passed on a report of a telephone call he had received from a friend employed in the American Embassy declaring an armistice had been signed. Howard, believing he had just been handed the greatest news story of the his career years, circumnavigated the various systems of checks and censorship in place, going so far as to forge the signature of his foreign editor. He transmitted the story to New York unscrutinized, giving the time of cessation of hostilities as 2pm - eight minutes after this picture was taken. Traders on Wall Street were the first to be aware of the news, and trading ended at 1pm. As the news spread, the entire city was caught up in the celebrations. The next day, the New York Times described the United Press transmission as "the most flagrant and culpable act of public deception.” The Armistice treaty signed at the end of World War One by the Allies and Germany at Compiègne, France, went into effect on the eleventh day of the eleventh month at the eleventh hour, 1918. Yet close to 3,000 men lost their lives on the final day of the War, as, despite the announcement of the Armistice, fighting did not actually cease until that specific moment. The hanging of the conspirators in the assassination of Lincoln, at Fort McNair, Washington D.C. The assassination of Lincoln in April 1865 by John Wilkes Booth was part of a conspiracy to bring down the Union government. The plot would have seen the simultaneous killing by conspirators of the President; Vice-President Andrew Johnson; and Secretary of State William Seward. Only Booth succeeded. While Booth was killed before he could stand trial, other conspirators were taken and imprisoned. Three months after the assassination, on July 7th, four of them - Lewis Powell, David Herold, George Atzerodt, and Mary Surratt - were hung at Fort McNair. The scene was captured by Scottish photographer Alexander Gardner. The gallows was constructed specifically for the occasion. Mary Surratt, whose Washington boarding house was a primary location in the conspiracy, became the first woman to be executed by the US federal government. Soldiers of the 369th 'Harlem Hellfighters' wearing the Cross of War medal pose for a photo on their trip back to New York. In this picture we see: front row (left to right) - Private Ed Williams; Herbert Taylor; Private Leon Fraitor; Private Ralph Hawkins. Back row (l-r) - Sergeant H. D. Prinas; Sergeant Dan Storms; Private Joe Williams; Private Alfred Hanley; and Corporal T. W. Taylor. When America joined the Great War, the first African-American regiment to fight was the 369th Infantry, transported to France at the end of 1917. The racism and discrimination the soldiers encountered had begun during training in America, and continued in Europe, with many white US soldiers refusing to fight alongside the 369th. After April 1918, under the control of the French Army, such discrimination lessened. Nicknamed the “Harlem Hellfighters,” the members of the 369th were renowned for bravery, ability and ferocity. On their return to New York City after 1918, they received a euphoric welcome, marching up Fifth Avenue. Workers build the Statue of Liberty inside French sculptor Frédéric Auguste Bartholdi's workshop, Paris. The idea for the Statue of Liberty was Frédéric Auguste Bartholdi’s. The Parisian sculptor wanted to create a gift for the US nation in the wake of the abolition of slavery - referenced in the broken chain at the feet of the statue. Construction commenced in 1877, and Bartholdi brought in engineer Gustave Eiffel to help with the statue’s inner framework. In 1885, the completed statue was shipped to America, assembled and dedicated the following year. A portrait of Abraham Lincoln, without beard, aged 37. It would be another fourteen years before Abraham Lincoln became the 16th President of the United States. Here, in an image by law student Nicholas Shepherd, Lincoln is photographed serving as a member of the US House of Representatives, just before he resumed his legal practice in Springfield, Illinois. Notably, Lincoln is clean-shaven. He grew his whiskers in 1860 as a direct response to a letter from an 11-year-old girl, Grace Bedell, who believed Lincoln’s lack of beard was impeding his political career. A man of Japanese ancestry teaches his grandson to walk at Manzanar War Relocation Authority Center, California. After the Japanese attack on Pearl Harbor in December 1941, around 120,000 Japanese Americans were forcibly removed from their homes, leaving behind all their business and goods, and were transferred to concentration camps, known as “relocation centers.” Around 80,000 were native-born American citizens. This image by Dorothea Lange was taken at the Manzanar camp, northeast of Los Angeles. More than 10,000 people were detained at the 500 acre camp. Like all such camps, Manzanar was treated as a military installation, with towers, barbed wire perimeters, and armed guards. Before Manzanar closed at the end of 1945, one hundred and forty-six people had died as camp internees. Documentary photographer Dorothea Lange created a significant body of work in the Great Depression, working for the U.S. Farm Security Administration. Born Dorothea Nutzhorn, her parents were second generation immigrants from Germany. Awarded a Guggenheim Fellowship in 1941, she resigned it in order to photograph the forced evacuation of Japanese Americans. Most of her images were seen as critical by the military, and were impounded for more than five decades. Mulberry Street was at the very centre of Manhattan’s Little Italy, an ethnic neighborhood that followed from the mass immigration to New York of Italians after the 1880s. By the turn of the twentieth century, nine out of ten people in the Fourteenth Ward of Manhattan had an Italian background. Mulberry Street itself took its name from the Mulberry trees that grew around Mulberry Bend - the point in the street where it curved around what was then the Collect Pond. This scene, shot in 1900, shows something of the breadth of activity of Little Italy - vegetable stalls; barefooted children; shoe, boot and clothing merchants; a wagon of barrels and sacks; furniture removal men; and blankets, quilts and rugs left out to air - or to sell. “11 a.m. Newsies at Skeeter’s Branch, Jefferson near Franklin. They were all smoking. St. Louis, Missouri.” As a photographer working for social reform, Lewis Hine found a number of advantages in photographing “newsies” - boys who sold newspapers on street. Unlike the work he did photographing child workers in mines, factories and mills, Hine could photograph the boys without either seeking permission from employers, or, more typically, circumnavigating them. The photographs could be achieved with more time, and with more focus and attention on the subjects he shot. To achieve this sense of direct connection, Hine would bring his camera down to the eye level of his subjects. Not only taking photographs of child workers, Hine also talked to them and sought to document and record their experience. n aggregate, he created a body of work that displayed an unacceptable standard of living for many thousands of children and which ultimately achieved a change in cultural understanding of what it means to be a child, and in the law. A Douglas SBD "Dauntless" dive bomber balances on its nose after crash landing on a carrier flight deck in the Pacific. The WWII US Navy Douglas SBD Dauntless was a two person scout craft and dive bomber - SBD stood for Scout Bomber Douglas. With a range of 1,115 miles, a maximum speed of 255 mph and a bombing load of 2,250 pounds, it was an extremely successful aircraft in battle. First used at Pearl Harbor and then across the Pacific campaign, as well as in Europe, almost 6,000 SBDs were built. The SBD is best known for its role in the June 1942 Battle of Midway, when four SBD squadrons attacked four Japanese fleet carriers, sinking or fatally damaging all four. Towards the end of the war, the US Navy gradually replaced the SBD with the Curtiss SB2C Helldiver, an aircraft with more power. Sitting Bull and Buffalo Bill. Taken at William Notman’s studios in Montreal, Quebec, during Buffalo Bill's Wild West Show, in August of 1885, this photograph bore the title “Foes in '76 - Friends in '85.” Sitting Bull was 54 when he agreed to join William Cody’s Buffalo Bill's Wild West in 1885. Paid a signing bonus of $125, and $50 a week, his role in what was essentially an American circus was to ride round the arena once per show, in the opening procession. Sitting Bull was the star attraction - but after four months, he had had enough, and returned to the Standing Rock Reservation. It was a far cry from 1876, when, as spiritual leader to the Lakota Sioux, Sitting Bull had inspired his tribe in the defeat of Custer’s 7th Cavalry at the Battle of Little Big Horn. Following the battle, Sitting Bull was driven into exile in Canada, until starvation forced him to surrender to the US Government. Transferred onto Standing Rock, Sitting Bull was was shot and killed by a Reservation police officer in 1890. The "Street of Gamblers,” Chinatown, San Francisco. Two men and one woman on board the American brig Eagle were the very first Chinese immigrants to San Francisco. From 1849, Chinese people were drawn by the laboring opportunities for the construction of the Transcontinental Railroad, as well as the California Gold Rush - though racial discrimination was pronounced and enshrined in law, culminating in the Chinese Exclusion Act of 1892, which outlawed immigration from China for the next decade. San Franciscan studio photographer Arnold Genthe was drawn to San Francisco’s Chinatown, capturing many hundreds of photographs of its people - often without their knowledge. The pictures are true to the culture Genthe saw - although he also cropped out Western elements. Here, Genthe has captured the essence of a Chinese hutong market transposed into San Francisco, crowded with men wearing black chángshān shirts and sporting the Manchu queue hairstyles - mandatory for all Chinese men until the 1910s. Excepting Genthe’s images, very few photographs remain of San Francisco’s Chinatown prior to the earthquake and fires of 1906. Most photographic collections were lost, but Genthe’s survived, stored in a bank vault. Portrait of Art Hodes, Kaiser Marshall, Henry (Clay) Goodwin, Sandy Williams, and Cecil (Xavier) Scott, Times Square, New York. Although born in the Ukraine, Jazz pianist Art Hodes was brought up in Chicago, and spent most of his career in “The Windy City”. Hodes became known for the Chicago Jazz style, but in order to find success, he had had to move to New York, in 1938. Here, Hodes and his River Boat Jazz Band - Joseph "Kaiser" Marshall on drums, Henry “Clay” Goodwin on trumpet, Sandy Williams on trombone and Cecil “Xavier” Scott played clarinet and tenor sax - are playing on a horse drawn cart to promote their concert that night - with special guest Louis Armstrong and Jack Teagarden. Writer and (self-taught) photographer William P. Gottlieb spent the ten years from 1938 to 1948 interviewing and photographing the leading, largely New York-based, jazz musicians of the time, including Duke Ellington, Ella Fitzgerald, Dizzy Gillespie, and Billie Holiday. A columnist for the Washington Post, Gottlieb started to take his own pictures when the Post wouldn’t pay a photographer. The U.S.S. Recruit, a wooden battleship built by the Navy in Union Square, New York City, to recruit seamen and sell Liberty Bonds from 1917 to 1920. In order to drive up recruitment to the Navy - and to train those so recruited - the US military commissioned the construction of a full and seaworthy battleship in the middle of Union Square, Manhattan. The ship was staffed, with a captain, and was equipped with wireless and quarters for officers and other crew. It also had searchlights - illuminated at night. As well as functioning as a successful training and recruiting unit - more than 25,000 men joined the US Navy via Recruit - the ship was also deployed as an event and reception location, hosting, amongst other occasions, a visiting group of Native Americans, and a christening. The ship remained in Union Square for the duration of the War and beyond, finally being decommissioned and dismantled in 1920. The six guns it carried were wooden replicas.